1. 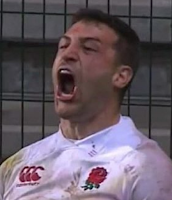 Let's not try to pretend that England are anything other than in crisis, notwithstanding ending their losing streak in a dead rubber, in wet conditions, on a slow track, against an understrength Springbok side in Cape Town. 2. Jonny May, however, is now a fully-fledged international class winger. 3. Jury is out on the Springboks. The core of a very good team is there but the Rugby Championship will tell us more. 4. Wales will be very happy with a 2-0 series win, having rested several senior players, albeit against a poor Argentina team. 5. Whether Wales are now (according to an overly smug Warren Gatland) "poles apart" from England remains to be seen. Don't forget Eddie Jones was in exactly the same position 12 months ago. 6. Scotland remain an enigma - spectacular on occasion but still horribly inconsistent. 7. The significance of the USA's first victory against a tier one nation (Scotland) should not be under-estimated. 8. Ireland are now an admirably efficient and ruthless outfit. Can they maintain their form through to the World Cup and will efficiency and ruthlessness, in the absence of a splash of inspiration, be enough? 9. Australia don't look that far away from being a more than decent team - and again I guess the Rugby Championship will reveal more.